Island Life. 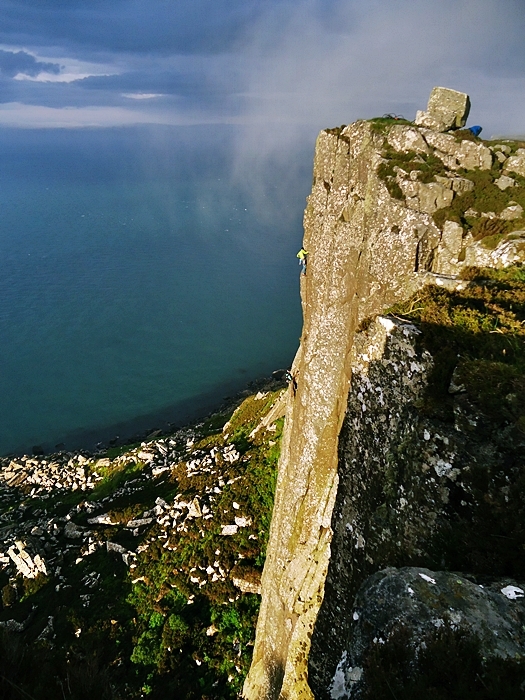 Part 1: Burren and Fair Head, Ireland and Northern Ireland. | Great Escape. Nick Bullock. ← Bones and Barbed Wire. 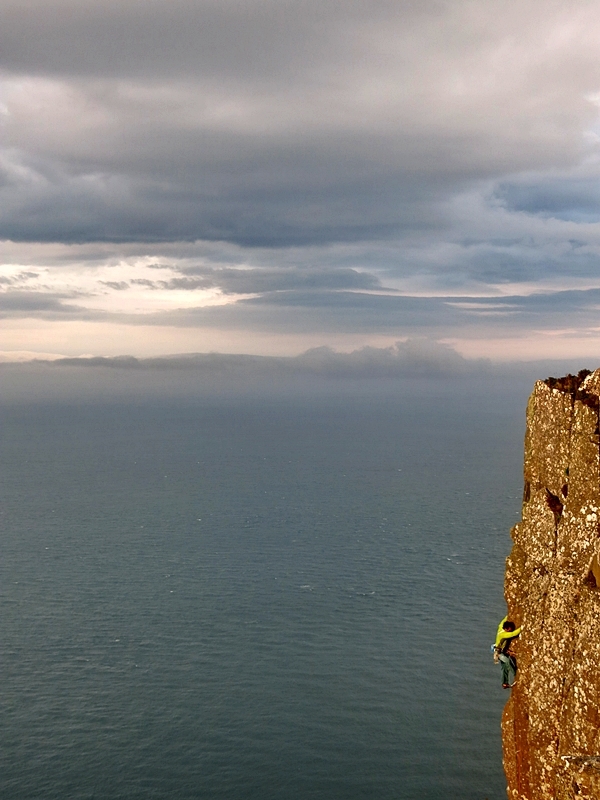 Hallowe’en Arete, Fair Head. Credit Tim Neill. A haunting layer of cloud trickled over the Paps of Jura. 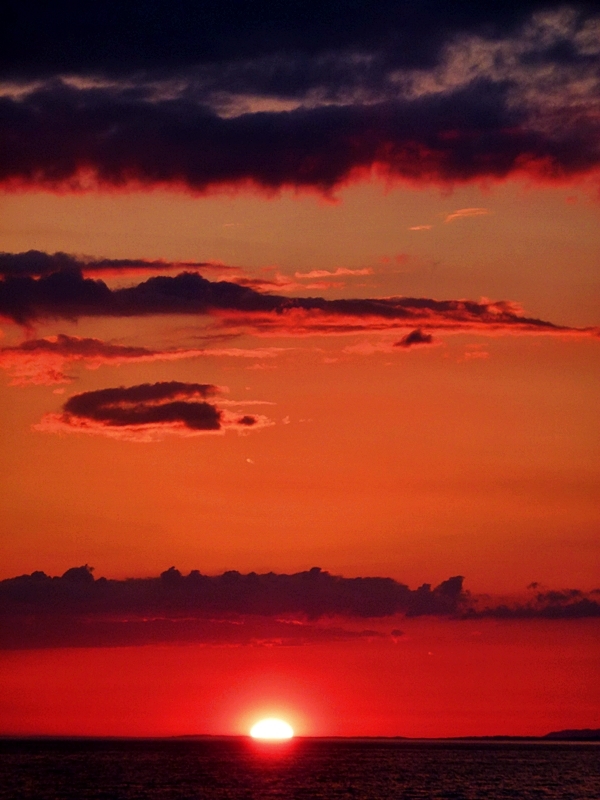 Flowing from the hills, driven by the breeze, it crawled across the North Atlantic. Rathin Island blurred. Wispy white tendrils of wet entered White Lightning Amphitheatre and butted Fair Head’s dolerite. And as I clung to the sharp of Hallowe’en Arête, I imagined tears forming on the ends of silver lichen. 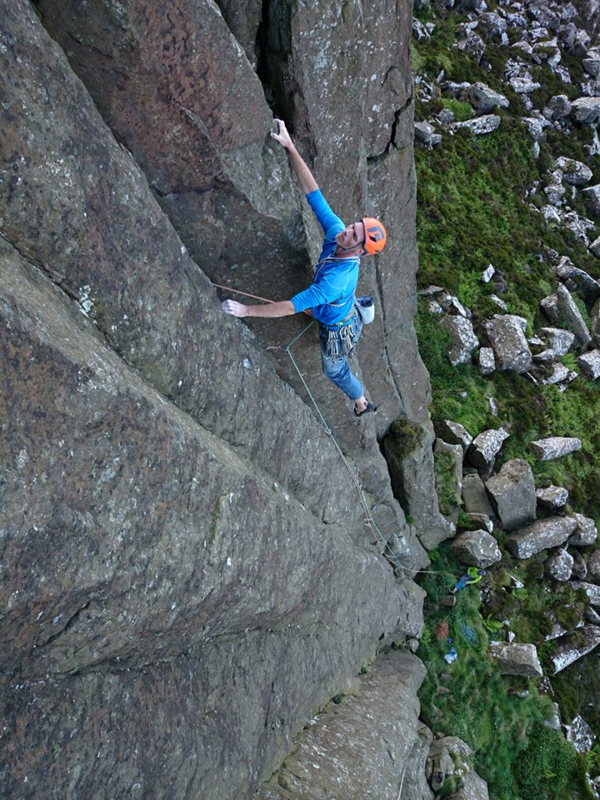 The eight day trip was nearly at an end but above me there was still the crux moves. Dunking my left hand, chalk dust caught on the breeze. Lee Roberts hung below me, belaying, looking up, smiling. 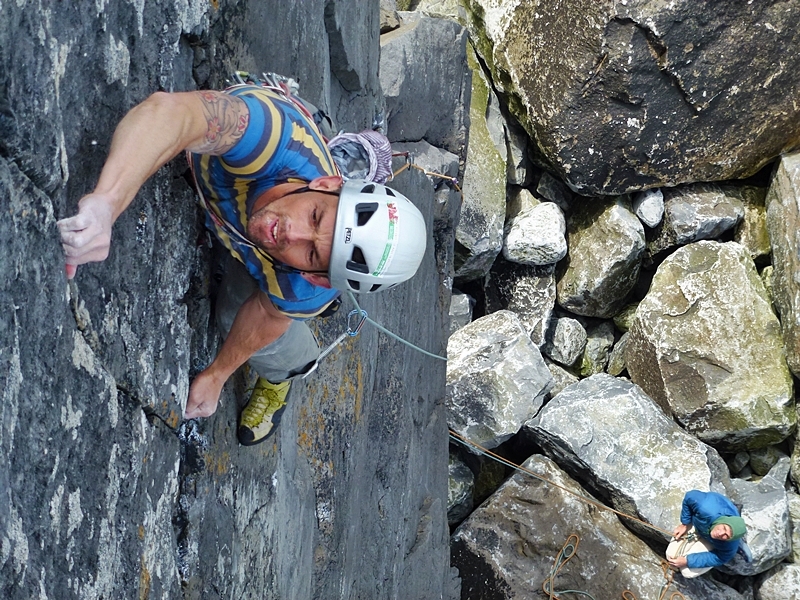 Lee had climbed the middle pitch of Hollowe’en – finger locks, hand jams, balancy compression – forty five metres of technical burley brilliance which topped the first pitch, a pitch of edgy green insecurity. At one point I thought about suggesting something else but at times, to get things done, to get through, to move beyond, you have to have resilience. I took hold of a chunk of dolerite. Sharp, the shape of a ship’s hull, stuck to the surface of the right side of the arête, I pulled and matched and moved around the arête, into a groove. The white cloud swirled in a darkening sky. A crack ran the length of the groove and unlike much of Fair Head’s rock, the crack was dry and clean. The rock all around was crisp and grabby. I joked with Lee that a spider’s web was reason to take the slab around the other side but it was just a joke, I wanted to try hard for the last climb of the eight days, I felt I deserved it, I needed the difficulty. Trying hard, becoming engrossed, it eased the pain of failure from other aspects of my life at the moment. A few days earlier, Mirror wall at The Burren in the south, glowed in the afternoon sun and in the afternoon sun the heat increased. 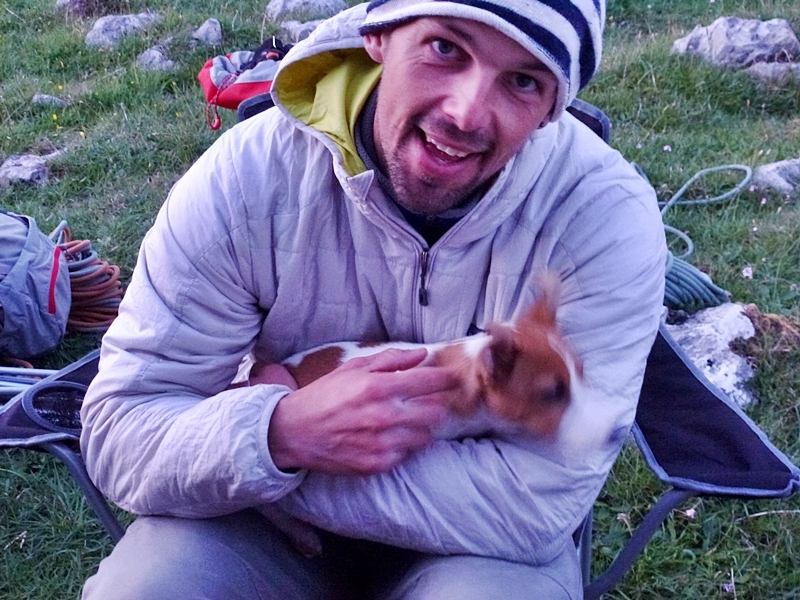 My fingers greased from the one insecure lock in the forked lightening crack near the start of the climb, Refraction, while my feet, stuffed into small shoes, grew in size and paddled. Three times, up down, up down, up down. The large boulders at the base of the wall sat in the sea cooking like hardboiled eggs. The fourth time up, or maybe it was the fifth and I was through the gammy finger-lock but still greasing from the most secure placements ever. 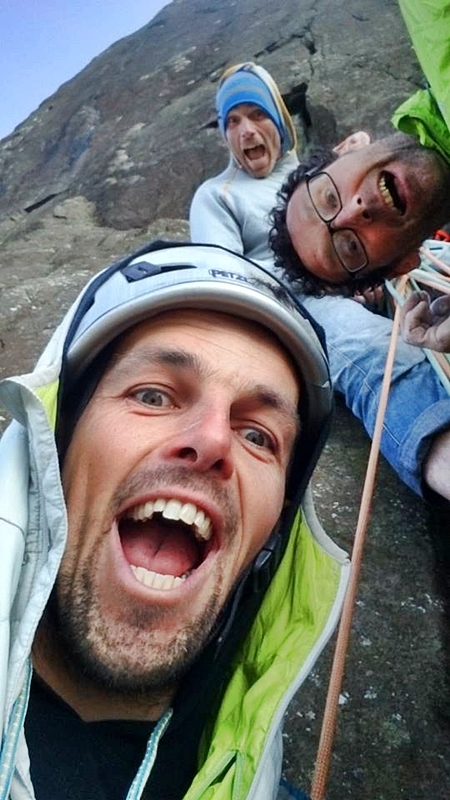 Lee belayed and Tim sat on one of the hardboiled eggs. They both shout encouragement and as they yell, I watch a hand slowly slide from a secure placement. My body and mind begin to wobble. But then some form of my younger self takes hold, a younger more carefree self and the memories and pain are left behind and I slapped myself up the wall, through the overlap, onto the crozzled tuffa’s near the top and finally onto the grassy ledge wearing a massive smile. Spider crabs, Black guillemot with fiery red legs, wild orchids, a jack Russell puppy called Cookie, Lee’s sharp wit, Tim’s fat fingers unable to fit into the pockets at the top of Ice Queen, A Wall of Fossils, A Fall of Wossils, Quicksliver, a school of Dolphins breaking the Atlantic surface and another fire-filled sunset – the Burren is a good place to accept and attempt to move on. Bridging. The arête is now on my left and for the first time in weeks I open my mind to movement and possibilities of rock. A left-hand slaps. Under-clinging the arête, its shape is sharp and positive. I heel-hook the same sharp edge and stand in balance. What if life could be balanced with something as simple as a heel-hook? 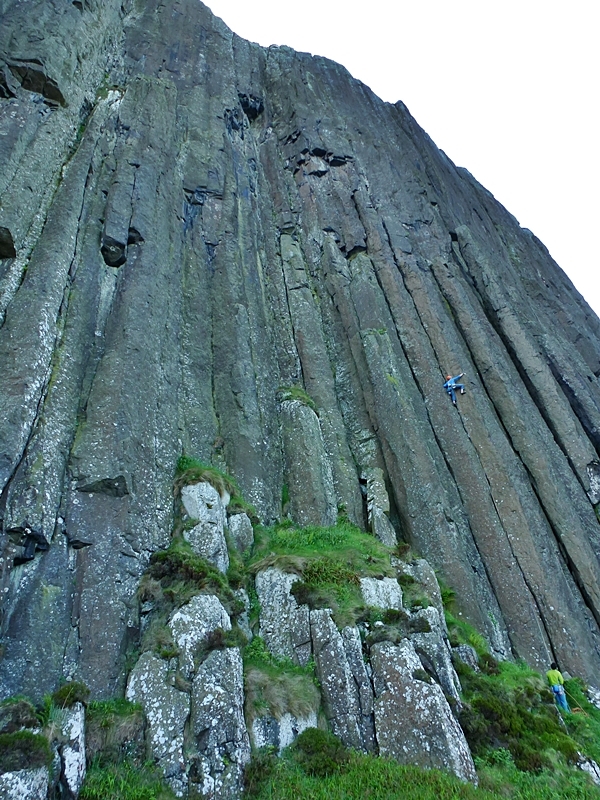 Arête climbing is close to being my favourite. All of those hidden possibilities that only reveal with courage and imagination and experimentation. I fiddle another perfect piece of protection into the crack running the length of the groove. Shaking-out, I savour this airy 9pm on a Sunday evening. Last night, Saturday night – in the cow shed – crowds of climbers congeal – the Fair Head meet comes together. 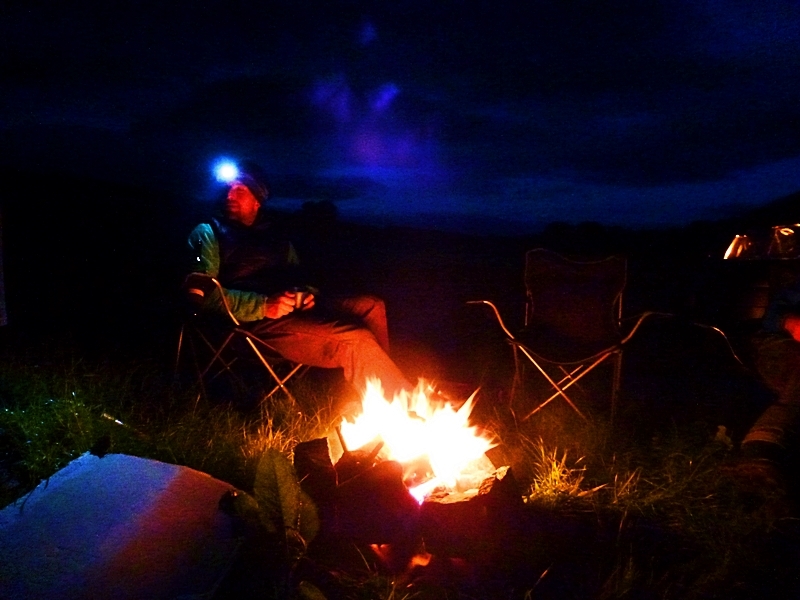 Outside the shed, under the stars, I stand by the fire, eating half of the biggest pizza ever while tilting a bottle of beer. I feel – well, I don’t really know what I feel, a true mix of emotions. Ricky Bell laughs and jokes and offers me a chug of the Jägermeister he has been offering around in the dark green bottle. I turn Ricky’s offer down but my stomach warms anyway with his infectious smile and effervescence. “It’s like Calpol.” He jokes and laughs – a large mouth full of teeth takes in the smoky evening air. “Let’s get out together sometime Nick.” The evening was sociable and fun and poignant and sad but I came away feeling a part of something and a step nearer somewhere. Pulling into the groove, a smear for the left foot on the front face of the arête and an edge for the right foot on the right wall of the groove, I stretch for the crack where it narrows and crimp a sharp edge and pull. Heel-hooking a rounded bulge holds my body and enables a left hand to reach for the same crack my right fingers crimp. This is it, this is the crux, this is what I’ve been working toward and now I’m here I’m damn sure I’ll give it everything to get through and continue to the top. 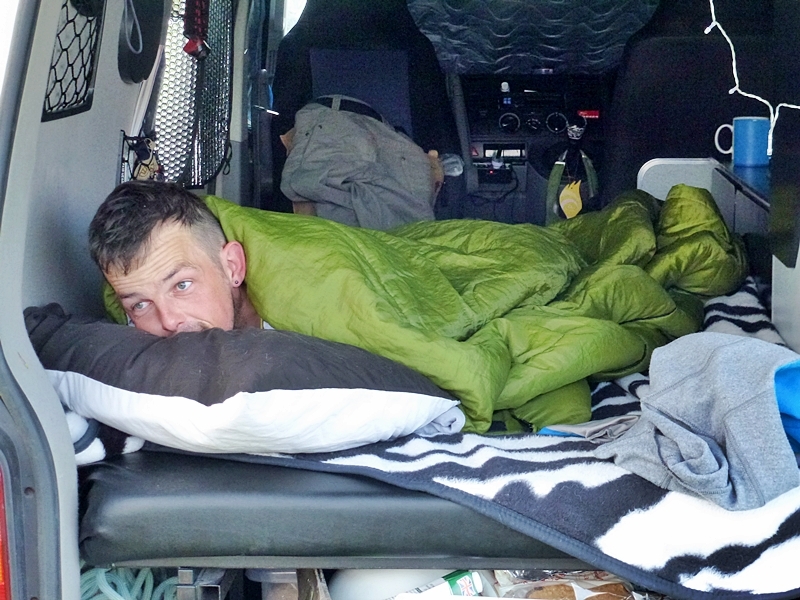 “There’s a big hold to your left on the arête.” Tim shouts from his viewing platform. 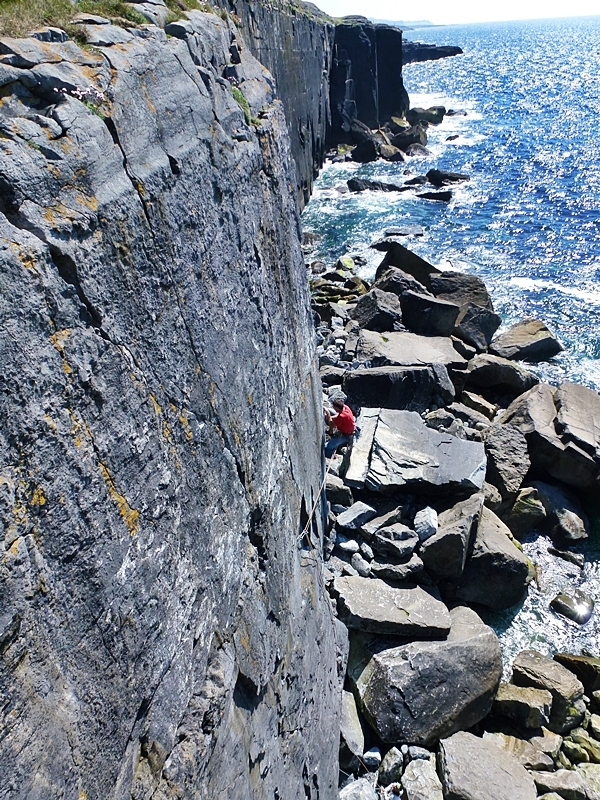 Thanks to Tim, Lee and John for the pics and the belays and the great company and a big thanks to Paul Swail and Sean McBride for yet again pulling it out of the bag and making the weekend of the Fair Head meet brilliant. Tim Neill climbing Fall of Wossels. The Burren. Quicksilver on The Mirror Wall, The Burren. Credit, Lee Roberts. 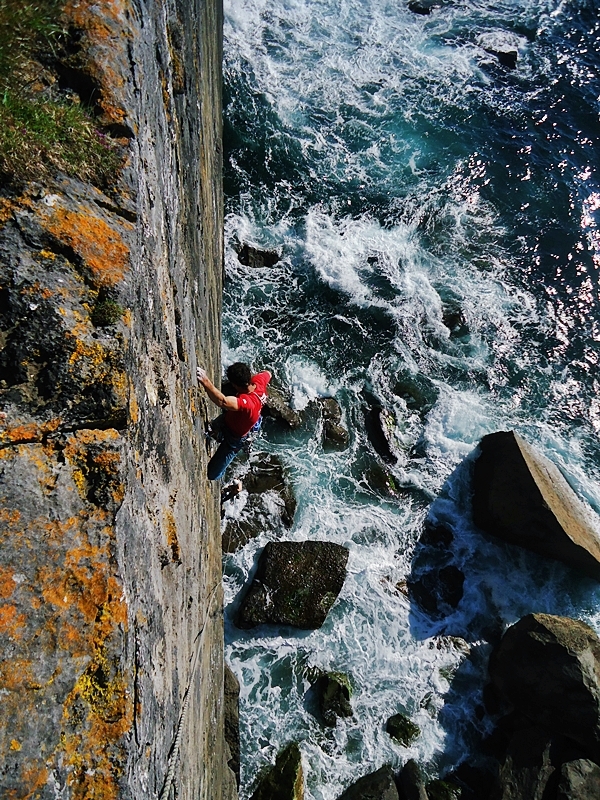 Tim Neill on the first pitch of Northern Exposure, Fair Head. Credit, Lee Roberts. Loons on the Northern Exposure belay. Well it is possibly the best route in the world! 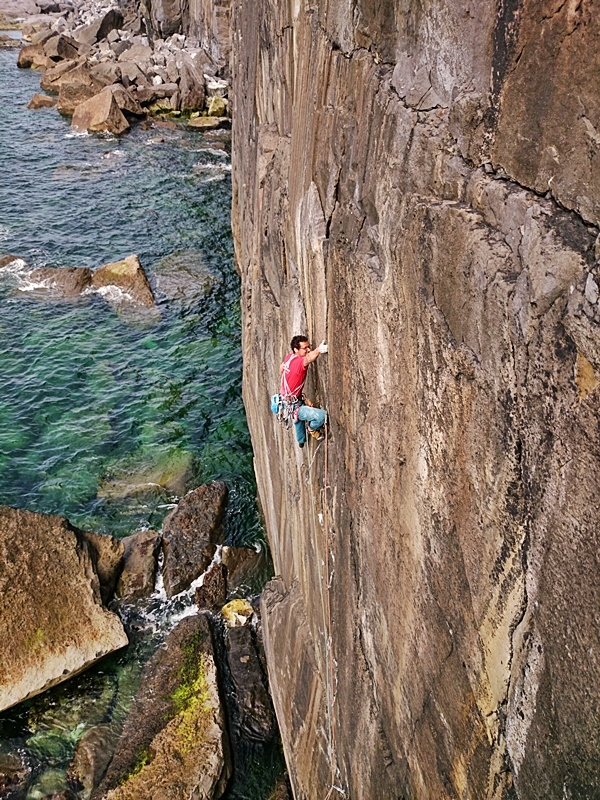 Tim Neill on the first pitch of X Men, Fair Head. Credit Lee Roberts. 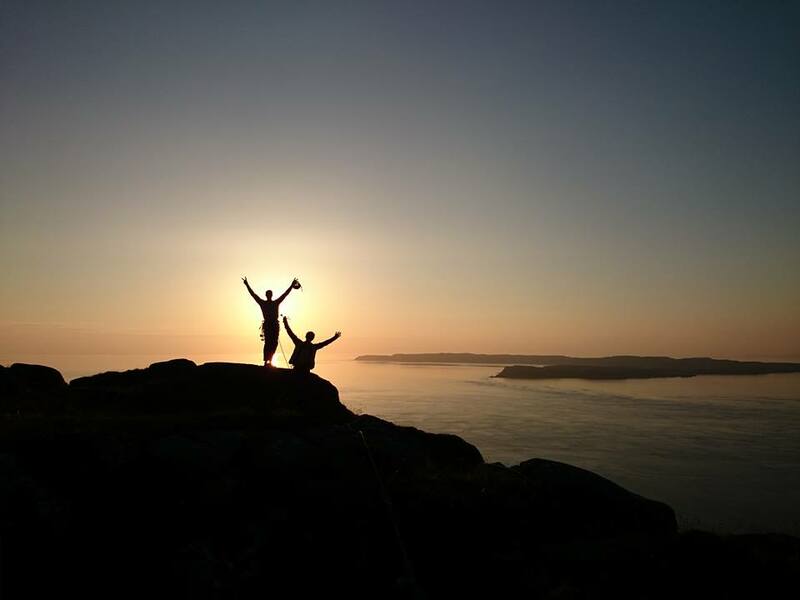 A happy Fair Head sunset after climbing Northern Exposure. Credit Lee Roberts. The final night at Fair Head.